From record temperatures to proliferating wildfires and rising seas, climate change poses an immediate and escalating threat to California’s environment, public health, and economic vitality. Recent climate-related events – such as the devastating 2017 wildfires and the record-setting 2012-16 drought – have highlighted the challenges that confront the state as its climate continues to evolve. California has been a pioneer in addressing climate change. 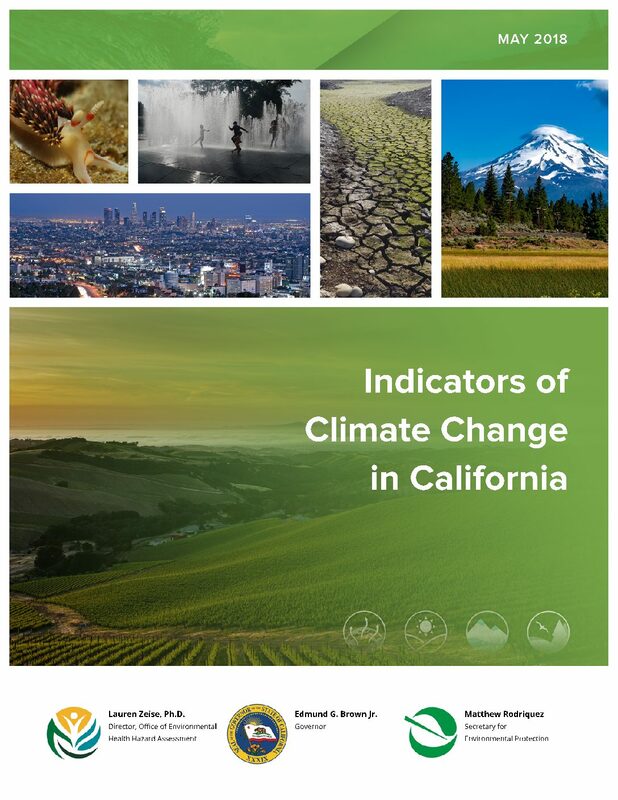 This report helps support policy decisions and facilitates communication about climate change by providing, in a single document, indicators characterizing its multiple aspects in California. Indicators are scientifically-based measurements that track trends in various aspects of climate change. Many indicators reveal discernable evidence that climate change is occurring in California and is having significant, measurable impacts in the state. The report’s 36 indicators are grouped into four categories, as listed below. The report discusses what these indicators show, why they are important, and the factors that may be influencing them. By any measure, California’s agriculture, hydroelectric production, domestic use, riparian health, and recreation all put tremendous demands on the state’s often limited water resource. Because of California’s Mediterranean climate, little significant precipitation occurs during the summer and autumn months. Accurate assessments of mid-winter precipitation, therefore, are a vital determinant of the state’s available water. During most years, maximum snow water equivalent1 (SWE) in the Sierra Nevada denotes the annual peak of surface water resource. Snow water equivalent is a key index not only for forecasting stream and river flow timing and amount, but for a wide variety of water management decisions targeted days and months into the future. The goal of the snow survey is to obtain an accurate measure of SWE at predetermined locations: snow courses. Snow courses typically have between five and ten measurement points spread out over one or more straight-line transects. Transects can be short, or several hundred meters in length. Some snow courses are coincident with recording or data-transmitting weather instrumentation; many others stand alone in very wild and remote locations. Most snow courses are measured once per month throughout the winter (accumulation) and spring (ablation) seasons, though some may be measured at different frequencies. Several California snow course records go back to the 1920s (some to 1910). Data from the measurements are used to develop—and continuously refine—indices of stream flow for the respective watersheds. A critical first step in characterizing the spatial and temporal distribution of California’s SWE is by measuring its 261 snow courses throughout the state. 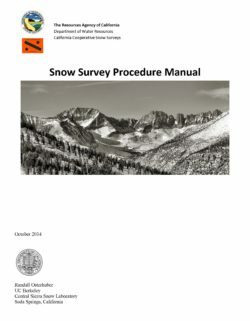 The aim of this document is to address snow survey procedure and equipment, review data collection, and discuss surveyor safety. While some subjects (avalanche safety, wilderness first aid) are, in their entirety, beyond the scope of this work, industry standards and procedures are presented. The author hopes this document will find utility as an office-based training manual for those new to snow surveys, as well as a field guide and reference to all who conduct snow surveys. As of this writing, many advances in the remote sensing (by ground-, aircraft- and spacecraft-based instrumentation) of snow cover are being developed. No doubt these developments in both procedure and instrumentation will continue to advance. However, there currently exists no practical, automated technique with which to measure SWE at the number of locations and at the point-accuracy of ground-based, manual measurements. Manual measurements remain the standard for calibrating and “ground-truthing” automated instrumentation, and have the advantage that they can be obtained independent of most surface and weather conditions. For the foreseeable future, snow surveys will continue to be a vital part of the water management structure in California.